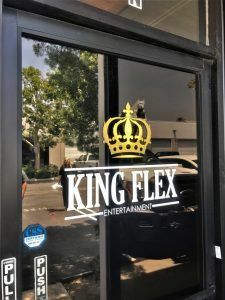 King Flex Entertainment is a Los Angeles-based production/entertainment company that has an office just up the street from us. They were in need of a vinyl graphic on their door, and they found us quickly on Google since we were local. With most businesses that sell goods, national or even international advertising is common because consumers can order online and have their purchase shipped to them. But with signage, it’s a little different. For the most part, we’re installing the signs for our customers so we want to make sure that we’re close, and that the installation cost isn’t too much for the customer. We can also ship signs but that’s a special case, and the fright can be very expensive depending on what the sig is made from. Since we were only a few miles away, getting this job done was quick and easy. They had two versions of the logo, one with black lettering and one with white lettering. 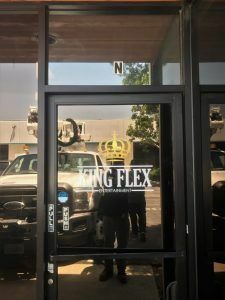 For door glass graphics, we almost always go with white vinyl because it’s the most legible against a reflective surface. We will use a digital print if we’re trying to match a color or print a logo, but for lettering, white is the best choice. Black vinyl reflects with the glass so it is very hard to read. Once we had a photo of the window with the measurements, we were able to create a dimension for the graphic easily to provide an estimate. The most important things you want to provide to a sign company when you’re looking for a sign is what you want on the sign (preferably with an art file), photos of where the sign is going, and measurements of where the sign is going. This is the quickest way to get you an accurate quote. Once the price was signed off on, we provided a proof with a rendering to make sure that he was 100% happy with how the graphic would look before we made it. You never know how a sign is going to look until you see it, which is why renderings with a detailed proof are very important. The decal came out looking great, and will definitely help people find the location. There are many different ways to do window graphics, whether you are displaying your logo or providing information about your business. No matter what your window graphic needs are, we will make sure that your information is presented exactly how you envisioned it.